So, I don’t have hazelnuts.. Do you know of anything else I could use as a substitute? this no dairy diet is killing me, haha. If you have cashews, those would be the best substitute. Failing that, almonds would work, but they’ll give the fudge a nuttier flavor. Kind of like chocolate-flavored almond butter. I just made this recipe with cashew nuts – it turned out fantastic. Thanks for the feedback–I’m glad it turned out well! I haven’t had it happen with this recipe, but I’ve made truffle recipes with coconut oil where the oil doesn’t incorporate fully at first. I think it’s because the ingredients get a little too warm in the food processor, so usually I let them sit for a little while (or pop the food processor bowl in the fridge for a few minutes), then try again. I’m sorry it didn’t work out for you! The same thing happened with mine. Not sure why though. I don’t have a food processor powerful enough to handle nuts. What if i use hazelnut butter? It’s needed for texture, and if the fudge tastes nutty, even better. I haven’t tried it myself, but I don’t see why it wouldn’t work. You might want to start with a smaller amount since the measurement for hazelnuts won’t be equivalent to hazelnut butter. The fudge squares look great and I can’t wait to try them out! My only concern is that I’m following a strict diet recipe, and because of it, I can’t use maple syrup. Is it fitting if I used agave nectar as a substitute? Would the fudge turn out the same? What are the options to replace the hazelnuts if allergic to nuts and dairy? I think you’re going to have to find another recipe – you could substitute other nuts for the hazelnuts, but since this is a nut-based fudge, any other substitutions would completely change the recipe. I’m going to try this. I have a family member allergic to dairy. Thanks. just wanted to say I made this on the weekend and it was absolutely delicious! Oooh I love making fudge! I made a really yummy peppermint fudge last year that I want to make again this autumn/winter. These did not come out for me at all, they totally coagulated and the oil separated leaving the chocolate all lumpy. Had to throw the whole batch out. Made this with my thermomix & omitted the maple & vanilla & instead added 4 tbsps of date paste (to make it sugar-free), & topped with dessicated coconut, soooo good! Starting on week 2 of a plant based diet and I was having a very intense craving for something rich and delicious. This fit the bill perfectly. Thank you! I made this recipe. First, I followed it to the letter (except that I couldn’t find hazel nuts, so I used cashews) and it turned out way too oily. I used virgin, unrefined coconut oil, maybe that was the problem. Anyways, the second time I made it, I used half the amount of coconut oil that the recipe called for and it turned out wonderful! It really is a good recipe, but maybe you should use less coconut oil if you live in a hot, humid environment like I do. I live in west central Florida. Will this fudge melt or get squishy if left out at room temp? I need to be able to wrap the squares in plastic wrap and hand them out in goodie bags. Will this work? 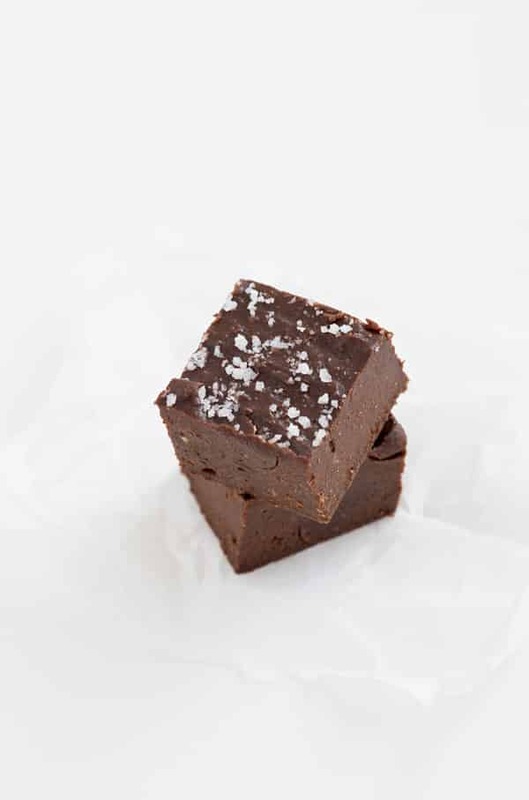 Is it possible to bake this recipe like dairy fudge so it becomes more solid at room temp? 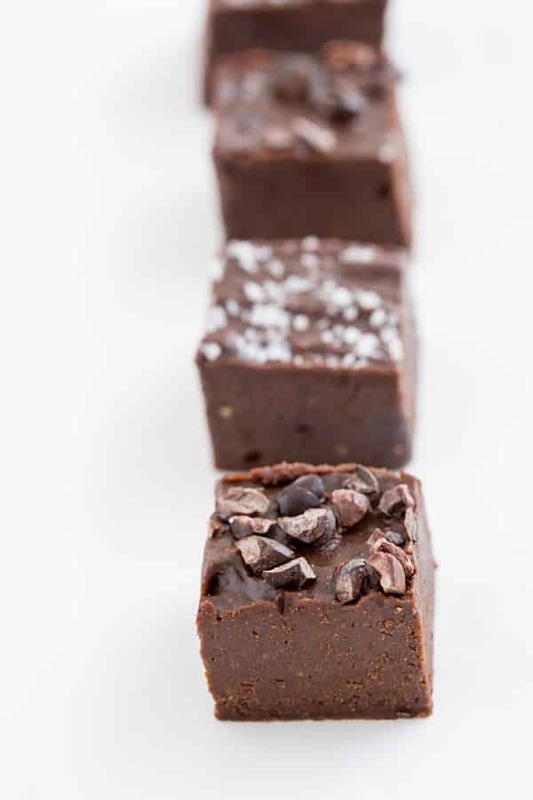 Baking the recipe wouldn’t work and it does get really soft at room temperature; this is definitely different than regular fudge! I had a separation problem and believe that it was due to heat generated by my food processor. The next time I make this, and it will happen, I will blend the dry ingredients first so that the nuts will be blended with the chocolate. And then add the rest. These are so good! Chopping the nuts in the blender first helps. I used egg beaters to mix everything together. That works. I added 1 TBSP more syrup and 1 t sp more vanilla. I like my fudge sweeter.